The photographs in this series are constructed based on newspaper accounts and oral histories of interactions between humans and animals in and around Matamoras, a small town in Northeast Pennsylvania that borders a state forest. Each photograph was inspired by Amy Stein's conversations with local residents. 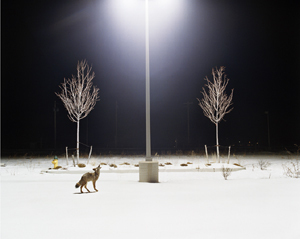 The photographs serve as modern dioramas in which to consider a new natural history. Within these constructed scenes, the artist explores the paradoxical relationship between the "wild" and how conflicting impulses continue to evolve and alter the behavior of both humans and animals. Raised in Washington, D.C., and Karachi, Pakistan, Stein is based in Los Angeles. Her work explores our evolving isolation from community, culture, and the environment. In 2007, she was named one of the world's top fifteen emerging photographers by American Photo magazine. She has exhibited nationally and internationally and her work is featured in many private and public collections including the Philadelphia Museum of Art, the Museum of Contemporary Photography, Chicago, the Nevada Museum of Art, Reno, the San Jose Museum of Art, and the George Eastman House, International Museum of Photography and Film, Rochester, NY. Her book, Domesticated, was published by PhotoLucida in 2008.